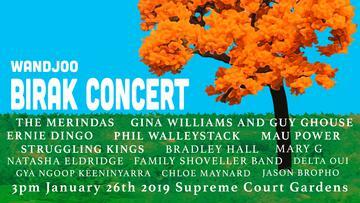 Phil Walleystack's Aboriginal Shows and Productions are proud to once again produce the Birak Concert in 2019. We would like to send a warm thank you to our sponsors for making this event possible. THANK YOU to THALANYJI for once again getting behind the Birak Concert. Thalanyji sponsored Birak in 2018 and was our first major sponsor to get on board to support Birak in 2019. Thalanyji are the traditional owners of the Onslow area and have an office here in Perth on Nyoongar Country. Thalanyji do business in Perth and always show respect to our Nyoongah country, people and community by getting behind community events on Nyoongar Country. A huge thank you to Thalanyji for the respect and support you consistently give our people. THANK YOU to MOORDITJ KOORT ABORIGINAL WELLNESS CENTRE for your support of the Birak Concert 2019. Moorditj Koort is the first and only Noongar organisation to get on board to support Birak, and also supported Birak in 2018. Thank you for leading the way Johnnie and the rest of the Board and staff at MK - your support is truly appreciated.